At the recent MLA conference, I was part of a panel called “Close Reading the Digital” with Jeremy Douglass, Mark Sample, Mark Marino, and Matt Kirschenbaum. Â Mark Sample recently posted a version of his talk, “Criminal Code: The Procedural Logic of Crime in Video Games,” so I thought I’d do the same. Â This is a condensed version of my talk, and it is part of both an article manuscript and a book project entitled “Ethical Programs: Rhetoric and Hospitable Code.”Â Also, if you’re interested in looking at the accompanying Prezi presentation you can find that here. I am also cross posting this over at the Critical Code Studies blog. It is now commonplace to argue that the Internet has fundamentally changed the nature of political campaigning.Â The Howard Dean, George W. Bush, and Barack Obama campaigns have shown us how fundraising, â€œGet Out the Voteâ€ activities, and volunteer mobilization all change significantly when certain new media technologies are deployed. But in addition to providing easier ways to connect and communicate, these technologies enable campaigns to make arguments in novel ways. This presentation examines the Obama campaign in terms of what Ian Bogost calls procedural rhetorics. Software enacts procedures.Â In addition to presenting text, sound, and video (say, the brochure-like material often presented on candidate websites or campaign commercials), software involves the crafting of computational procedures. And as we will see, the authoring of procedures is not confined to software. While one of my focuses will be the Obama campaignâ€™s social networking software, MyBarackObama.com (hereafter referred to by its popular shortened name: â€œMyBOâ€), we can also locate procedural arguments in the phone-banking scripts that the campaign provided to volunteers. Some of the procedural arguments I locate are not in line with the strategic narratives presented by the Obama campaign, but it is not my aim to play a game of rhetorical â€œgotcha.â€Â Rather, I hope that this presentation can show how the analysis of text, sound, and image can be usefully supplemented by an analysis of procedurality. Further, understanding procedural rhetorics offers citizens one route to a more meaningful engagement with software. Bogost develops his theory of procedural rhetoric in Persuasive Games.Â He argues that videogames use procedural expression to make arguments; gamers interact with those arguments and are asked to make decisions. Immersed in a model of a world, we are asked to embody characters and learn how the model works. But in his discussion of political videogames, Bogost argues that most political games fail to tap the affordances of procedural expression.Â Rather than making it possible for players to â€œembody political positions and engage in political actions that many will never have previously experienced,â€ most contemporary political games are little more than gimmicks (135). In an attempt to more effectively use procedural expression, Bogost teamed up with Gonzalo Frasca to design a videogame for the Howard Dean campaign. Players of the game were tasked with recruiting volunteers and distributing campaign literature, just as they would as volunteers for the Dean campaign. While the game succeeded in making an argument about grassroots activism, Bogost explains that â€œit inadvertently exposed the underlying ideology of the campaignâ€ (139).Â That ideology was, in the words of one critic of the game, more about the numbers game of Get-Out-The-Vote activities and â€œhanding out leafletsâ€ than about Deanâ€™s policy positions: â€œI have to believe thereâ€™s more difference between any two candidates than the image on the front of a brochure or the name on a signâ€¦If handing out leaflets for Dean is the same thing as handing out leaflets for Kucinich, why should I vote for either of them?â€ (139). While my own discussion here does not examine videogames, it does locate procedural arguments in the â€œMyBOâ€ social networking software and the campaignâ€™s phone banking scripts. Much like the Howard Dean game, the procedural rhetorics of the Obama campaign â€œinadvertently exposed the underlying ideology of the campaign.â€ During the campaign, the MyBO userâ€™s home page featured a point system. In an August 2007 blog post, Chris Hughes (a founder of Facebook who left the company to work for the Obama campaign) explained the points system: â€œJust about every action you can take on My.BarackObama now will give you points to make it easier to see all the hard work youâ€™re putting in to make this campaign succeed.â€ (Hughes). By assigning higher values to particular activities and by publishing a list of those with the highest point totals, the campaign made procedural arguments about which campaign activities were most important. This point system led game designer Gene Koo to call MyBO â€œone of the most important game titles of 2008.â€Â But Koo also pointed out that the game was far from perfect and that it tended to reward certain kinds of activities while devaluing others.Â He explains that his own volunteer efforts involved driving to South Carolina and working â€œin the trenches,â€ and such activities were not accounted for by the siteâ€™s point system (Koo). The point system was scrapped in favor of the â€œActivity Trackerâ€ in August 2008 (this was upsetting to some of the point leaders). The Activity Tracker provided a 1-10 scale that reflected not only the volunteerâ€™s number of activities but also how recently she had contributed her efforts. While the first iteration of the point system was purely cumulative, the new system made a different procedural argument by continually asking: â€œWhat have you done for me lately?â€ Sustained activity kept the index at 10, but a slow week of volunteer efforts would mean a drop in that number. 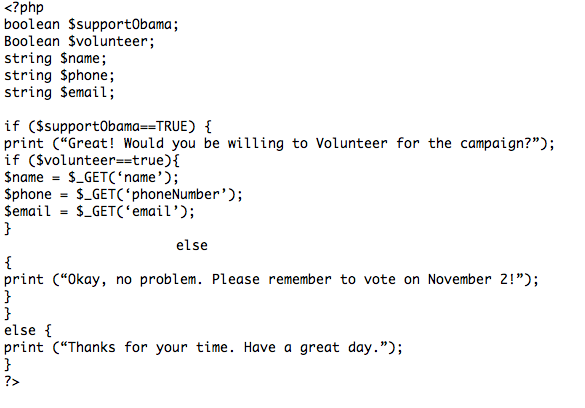 If we were to convert an Obama campaign phone banking script to PHP programming code, it might look something like the image above. This code is fictional in a number of ways.Â For one, itâ€™s not operational.Â There are some statements missing, and we would need to create some additional files in order to make this code run. But my main purpose in including this little bit of fictional PHP code is to demonstrate that both the Obama campaignâ€™s software and its phone banking scripts make procedural arguments. Further, I want to show that the answer to the question that opens this procedureâ€”â€œWho do you plan on supporting in the upcoming election?â€â€” instantly determines how long the call will last and how involved the conversation will be.Â If the potential voter indicates that s/he is a John McCain or Hillary Clinton supporter, the call may very well be over.Â The campaign volunteer is instructed to thank the person for their time and hang up the phone.Â If the potential voter is a strong Obama supporter, the procedure continues through a series of if-then statements.Â The caller asks questions, provides information about absentee ballots or polling locations, and sometimes even recruits a new volunteer. Many (not allâ€”some scripts were more involved) of the scripts provided by the campaign offered few instructions for how one might persuade a McCain or Clinton supporter to change his or her mind. This volunteer crafted his own if-then statements and worked through a new procedure, and he also shared his script with other volunteers on the MyBO website. The Obama phone banking script is not evidence that the campaign was programming its volunteers.Â Instead, it is evidence that volunteers engaged with the campaignâ€™s procedural arguments by editing, revising, and extending them. The Obama campaign often relied on two key narratives. The first was that President Obama would engage opposing arguments. During a debate sponsored by CNN and YouTube, candidate Obama said that he would be willing to meet with leaders of Iran, Syria, Venezuela, Cuba, and North Korea without precondition. Obama also expressed admiration for Doris Kearns Goodwinâ€™s book Team of Rivals, which details how President Lincoln filled his cabinet with people who had run against him.Â And Obama did nominate one of his most fierce rivals, Hillary Clinton, to the post of Secretary of State. The campaignâ€™s second key argument was that Obama campaign volunteers were part of a peer-to-peer network of community organizers. The â€œYes, we canâ€ mantra of the campaign made the argument that the campaign was a purely grass roots movement. But a closer look at some of procedural arguments made during the Democratic primary and the general election reveals a more complex and sometimes contradictory stance. The procedural argument of many phone-banking scripts encouraged volunteers to bow out of agonistic exchange with supporters of McCain and Clinton.Â This argument runs counter to much of the campaignâ€™s rhetoric about conversing with enemies or foes. In addition, we have seen that the MyBO softwareâ€™s procedural arguments reveal a delicate dance between hierarchical control and peer-to-peer interaction. While the campaign spent a great deal of time describing volunteer efforts as peer-to-peer activities, it also exerted control from the center. A closer look at the procedural arguments mounted by the MyBO campaign allows us a full picture of the campaignâ€™s arguments and motives, and these conflicting arguments indicate that a deeper understanding of procedural rhetoric offers ways to understand all types of arguments, political and otherwise. Further, users can both interact with and author procedural arguments. This discussion of procedural rhetoric signals the importance of developing critical software literacies. Procedurality opens up new possibilities for persuasion and expression, and this invites us to think carefully about software as it becomes simultaneously ubiquitous and invisible.